The finest British sitcom characters are wrapped around sadness. Middle-aged men (for the most part) who feel that life has left them standing and they no longer control or even recognise the world around them. Think Basil Fawlty keeping the outside world at arms-length in his Torquay stronghold, Brian Potter trying to recapture former glories and being thwarted by his over-reaching ambition at every turn, and Edmund Blackadder who is obviously far more intelligent than his contemporaries (whichever time he’s in, although I don’t recognise the first series as even being Blackadder, since it stinks on ice) but will always be at the mercy at the vanity and stupidity of his social ‘betters’. Theres a saying that Comedy is Tragedy plus Time: with the best British sitcoms the Comedy lies the Tragedy Of Time. When you’re a 10 year-old, contemplation of the passing of time, existential angst and the drone of the treadmill are not things which occupy too much of your thinking. What does occupy a lot of time is football and telly, and ‘No Hiding Place’ is the perfect blend of the two. Except that theres no football in it. The majority of the episode involves Bob (middle-class aspirant: Rodney Bewes) and Terry (Geordie Mark E. Smith-a-like: James Bolam) trying to avoid hearing the result of the England-Bulgaria match, so they can watch it later that evening on TV. Their nemesis is Brian Flint, played by (one of the unsung-heroes of British comedy) Brian Glover, who hounds them from place to place attempting to tell them the score and win a bet with the pair. Bob and Terry are life-long friends (the eponymous ‘Likely Lads’) who have been separated for the last five years due to Terry (mistakenly) joining the Army. Recently reunited, the intervening years have treated them very differently: Terry is still the same person, but all the subsequent changes in civilian life have passed him by, so when he returns to Newcastle he disguises his fear of change with cynicism and sneers at what he considers to be Bob’s nouveau-riche snobbery. Bob, in the meantime, has become nouveau-riche. He now works in an office-job for his future father-in-law, and is moving into a new-build estate outside Newcastle city centre. He is well-and-truly upwardly-mobile, and he has been doing very well in the interim since Terry left England. Now he finds himself, if not exactly falling back into old ways, then occasionally mourning the passing of care-free irresponsible youth, of which Terry is only too quick to remind him. The hairdressers sets the scene: Terry assuming all the staff are gay and can consequently know nothing about football (‘Ever see a homosexual striker?’), being confused at the treatments on offer, and glad of the chance to do a runner when Flint appears. From here to the pub (the scene of Terry’s magnificent one-word comebacks to Bob’s list of countrys which highlights perfectly the differences between the two of them-Bob’s aspirations giving him a laissez-faire attitude to other cultures, while Terry, even though better-travelled, is still suspicious and fearful of outsiders), then to Terry’s sister’s flat, church (where Terry cheats at a game of I-Spy), and finally Bob’s new house, all the while being pursued by Flint. The beauty of ‘Whatever Happened To The Likely Lads‘ lies in the characterisation: the love of two childhood friends who are eternally linked but who can no-longer live in each others pocket; the associated sadness, fears and loss which this entails, and the difference between acceptance of those changes and the reluctance to do so. Time moves very quickly for some, and incredibly slowly for others. Did I mention it was a comedy? The acting is top-draw; soft-lad Bob, beautifully played by Rodney Bewes, is a snob who retains our sympathies. Despite all his best efforts he cannot fully escape his past, even though he knows he must, but it is this constant struggle which gives the characters their conflict. Terry, stuck in the past and terrified of the present, could easily have been Andy Capp-lite, but James Bolam plays him with a charm that belies his constant sniping and criticism. 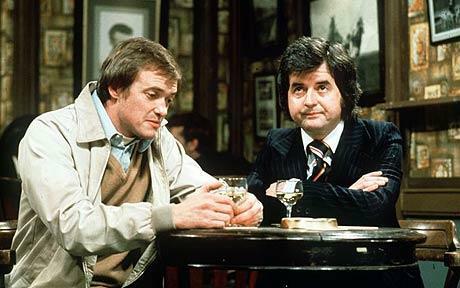 Any episode of ‘Whatever Happened To The Likely Lads’ is worth watching: this episode is the jewel in the crown. Oh yeah, KILLER theme tune too…. tagged as Bob, Brian Glover, James Bolam, Likely Lads, Newcastle, Rodney Bewes, Terry, Whatever Happened to the Likely Lads?